I have a particular fondness for the houses of Federal era New England---and if that house, as is increasingly rare, has survived in untouched condition---free of replacement windows, plastic shutters, or any of the dozens of injustices so often inflicted upon them by well intentioned (or not so well intentioned) owners, then so much the better. A little faded neglect? Better still. I understand all too well when I read Nancy Lancaster's musings on how the shabby and pure Virginia houses of her youth affected her aesthetic sensibilities, for so too is it for me with the faded houses that still populated New England in my own youth some fifty years later. I love these buildings for many reasons---for their reflection of the aspirations of a new country, for their classically inspired proportions and details, and for a certain provincial quality that pervades all but the most sophisticated examples. I wonder at their details, executed in the pine that was so plentiful in New England, but based on examples that would have been executed in stone in England, or in Italy whence came their ultimate inspiration. I mused recently in other posts about a pair of country houses in Dorchester, built for members of the glittering new society that formed around Boston after the Revolution. Thus, when I came across the photograph above in the course of searching pictures for my posts about the Swan (click here) and Morton (here) Houses, I was, as they might have said in Federal America, 'smote' between the eyes. Here it all was---and with the bravura gesture of the high pediment, a detail traveled from Palladian Italy via Georgian England. In years of passionate architectural tourism, I thought I had encountered them all, but this one, at least to me, was news. And its condition! Untouched, unimproved, shabby but not derelict. If I could marry a photograph, this would be the one. But, being an old fashioned guy, I thought we should become acquainted first, yet maddeningly little information could be found about my new love. The caption stated that it was the 'Dearborn Mansion, Grove Hall' and that the picture was taken in 1868, and apparently, like the Swan and Morton houses, had been in Dorchester. I googled myself into a stupor, and nearly went without dinner trying to find out more about my mysterious new love, but came up empty. I roamed through my own library, and not a bit more solid information could be found. A General Dearborn had been prominent in Roxbury and Dorchester affairs. A neighborhood in Roxbury, which borders Dorchester, is known as Grove Hall, after a long demolished mansion---but, that mansion was not Dearborn's. And what of its amazing design? What early designer had created this? One of the many talented carpenter builders? One of the early and rare architects, like Charles Bulfinch? Had its design come from a pattern book? And how, without knowing it, had he nevertheless so evoked the Veneto in this house, while he was probably only thinking of England? There are several related houses in New England that follow the general design of this house, but none quite have its elan. In Asher Benjamin's Builder's Companion, one of the designs shown is for a house with a tall central pavilion, and the fanlight in the Dearborn house, with its spiderweb tracery, follows one in Benjamin. Charles Bulfinch, like Stanford White, has more buildings attributed to him than are reasonable, but the central pavilion on the Dearborn house certainly makes one think of the library building that centered his design for the long vanished Franklin Crescent, Boston's echo of Adamesque London (and whose ambitious development ruined Bulfinch financially). 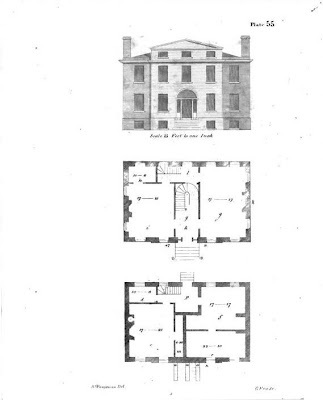 The Franklin Crescent, and Bulfinch's original drawing for the library at center. And then, what of those grand and graceful spandrels that flank the pavilion and give the design its unexpected Bravura? It is a composition and motif one sees over and over in English work, in turn inspired by Italian originals. One is immediately reminded of the end pavilions at Palladio's Villa Barbara at Maser. And Bulfinch mined the composition for his brilliant masterpiece, the so-called 'Brick Church' at Lancaster Massachusetts. The composition of the Dearborn house had been used before in New England. An early example is a house built around 1800 for Samuel Tenney in Exeter, New Hampshire. This house was built by a housewright named Ebenezer Clifford, working with a designer-housewright named Bradbury Johnson. Although probably nearly contemporary with the Dearborn house, its design, thought to be based on a plate in a pattern book by English architect Roger Morris, looks backward, and Georgian, rather than neo-classical in aspect appears to be earlier than it is. A few years later, Johnson would design his verion of Bulfinch's crescent for the New Hampshire Fire & Marine Insurance Company on Market Square in Portsmouth, again utilizing the high central pavilion (the right wing is now much altered). In Kennebunk, Maine, the William Lord mansion, built in 1801, closely echoes the design of the Dearborn mansion, but without the quite the scale and bravura and perfect integration of parts. The Sullivan Dorr house in Providence, Rhode Island, designed in 1809 by John Holden Greene follows the center pavilion composition, but with a flat roof. Here I digress for a moment, with a picture of the portico on the Dorr House, in an American Federal Version of the Strawberry Hill Gothick style, as applied to a house of American inspiration and otherwise neo-classical detailing. Portico of the Sullivan Dorr house combines Gothick details with neo-classical detailing on the ceiling cove. But now I've wandered a bit far from my original points, which were curiousity about the Dearborn house in particular, and in general the beauty with which the architects of the early Republic designed buildings that hark back to England of the 18th century, when her architects in turn were borrowing from 16th century Italy. And the tradition continued---compare for example, Phillip Trammel Shutze's 'Swan House', designed for the Inman family in 1928. It is fascinating to me to consider two designers, working in very different eras and circumstances, the later probably knowing nothing of the earlier house, but dealing with some of the same inspirations that had created the earlier house, arriving at the same design solutions, if on a grander and more sophisticated scale, 125 years later. Postscript: The first comment below mentions the modernist influence. To that end, here is a photo of the house William Welles Bosworth designed for himself in 1928 at Matinecock, Long Island, a sort of Vogue Regency modern take on Schinkel does ancient Rome. And another Postscript: Thanks to commenter Anonymous, of the Hudson River Anonymouses, for bringing Locust Lawn, one of the purest adaptations of Asher Benjamin's design, to the fore. I remember driving past it years ago, and naturally nearing going off the road (My bumper sticker reads "I brake for unusual Federal houses"). "Locust Lawn", the Josiah Hasbrouck House in Gardiner, New York, 1814. A most interesting account of the development of an architectural style with all the possible influences of Georgian England and Italy. For us, strangely perhaps, the Dearborn House looks rather Modernist in style. If it dated from the 1930s, we should not have been surprised. The fact that it would appear to date from earlier in a previous century we find fascinating. The Swan House has a most Italianate look and, for us serves to remind of so many water-filled Italian gardens. My love of colonial American architecture gets to stretch its legs through your posts about New England architectural history. My ancestors came from Exeter (the Gilmans and the Ladds). I try to drop in to Exeter whenever I go back but the interesting old houses are always closed on the days I pass through. Maybe one day! Is gushing allowed on the premises of this gentlemanly blog? The Dearborn house is without question one of the finest examples of its genre, being a provincial architect's version of a more sophisticated example. 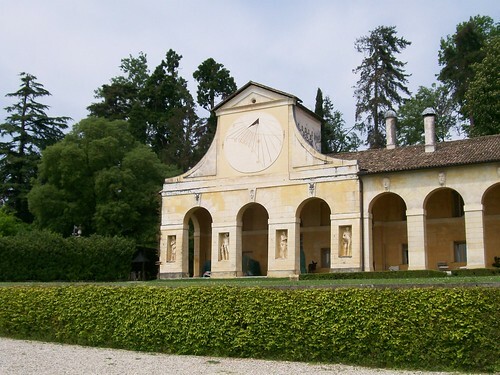 To take a frame house in New England and then link it, ultimately and convincingly, to Palladio's Villa at Maser,is what I call brilliant~along with everything in between. Fine job, Mr Dilettante! the mark. It's utter nonsense. It could be McIntire/Salem bias but I don't think that Dearborn house looks Federal: too "exotic" (Italian). I'm wondering about Dearborn himself: we have a very prominent street here in Salem named Dearborn but no Dearborns seem to have lived here at the time of its laying out. Could be this guy. Thanks, as always, for all sorts of enlightenment---I missed you last week! I am surprised to see that the Dearborn House was another that appears to be built on a berm plinth. Wow, that is one gorgeous building. Those fanlike spandrels are fantastic. Their inclusion was enough to give the building a certain level of sophistication but not enough to take away from the simple elegance of the facade. And I totally sympathize (yes, I feel your pain) with your inability to find any more pics or info about this place. I myself have been known to go all OCD after discovering some architectural treasure heretofore unknown to me. Who could sleep when there are still forgotten architectural details to be unearthed? Lastly, what the heck is it about seeing gothic (or gothick) details on a federal or Georgian house that makes me swoon? Generally speaking, I loathe seeing dissident styles mixed up together, but with this particular combination, I get all week in the knees. Weird! A thoughtful and though provoking essay and while the details of the houses do induce fainting spells, I find myself coming back to the Idea of a house in a new republic filled with optimism looking forward and with an appreciation for the past. The reverence for proportion and simplicity while still carving out a personal expression is an admirable thing. Hattats, the cleanness of the design does remind one of some Vogue Regency moderne, more than modern? PGdeB, just as I get my Italian fix through you! Toby, yes, but how do you really think about it? Reggie, thanks. And I too hope a reader comes through with some enlightenment. Devoted, I can see we're getting you worried about those berm plinths (artifice was, after all, much in fashion in those days), and I promise, my next Federal house post will sit firmly upon the ground. Anonymous, you are today's hero. I actually held this post off for a week, trying to remember where I had seen photos and what the name was, of just that house, and it simply WOULD NOT come to me, and now, there you are, Deus ex machina, with the picture and the name. It is the perfect evocation of Benjamin's plate. Many thanks! (Locust Lawn, Locust Lawn, Locust Lawn....) There is another example, without pediment, in Canandaigua, called the Granger House. Morphing the Dearborn Mansion into the Atlanta Swan House was brilliant!! I surely didn't see that coming. I can see the modern vibe of the Dearborn Mansion, very minimalist. Minimalism always seems modern to me, be it 17th, 18th or 19th century. Anything which is timeless is always modern. To me anyway... I define white as modern while color can define a decade or period. Anonymous, forgot to add, with you both on the OCD and the mixed up Gothic(k). I've got some pictures for a post someday about the marvelous Greek Revival tinged with Gothic that one finds up here. HBD, indeed. Those are several of the reasons this era appeals to me. I just hope the McMansions of today aren't as true a reflection of our times as I fear they may be. Oh dear. mdrnpntofvu, I blush to immodestly confess to being rather pleased with myself on realizing that one, and am pleased that the surprise unfolded as I hoped. Thank-you. Made my evening. Why do you torment me so. I've been gnawing on this for 3 days, getting nothing in the todo pile done. You say "a General Dearborn," as though you don't yet have his full identity. I'd like to get his identity pinned down [and that of his spouse/relatives/etc on way to finding an architect/builder in the mix somewhere], and keep going deeper from there. All in service to uniting you with your true love, you understand. Do you think this could be he? But then you said you googled past dinnertime, so perhaps you'd already eliminated these gents. 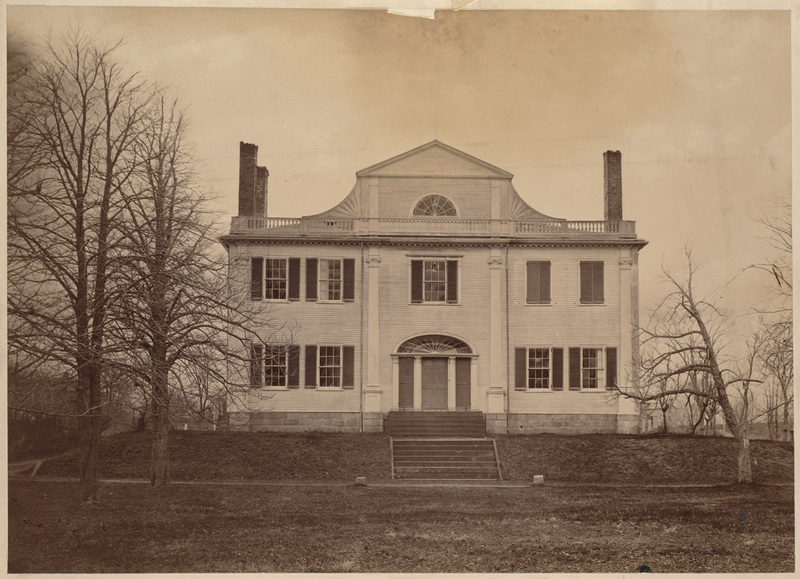 "When Gen. George Washington arrived in Cambridge, Gen. Artemas Ward took command of the American army’s southern wing, and used this house as his headquarters. 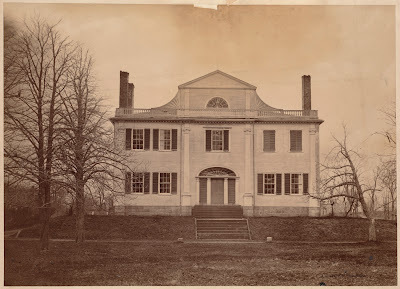 Later, in 1809, Gen. Henry Dearborn, who had started his military career as a young officer from New Hampshire in the siege of Boston, moved into the mansion. By the mid-1800s, the building had been modified almost beyond recognition. Soon after the publication of Fannie St. John, a fire damaged the eastern portion. By then a Catholic order, the Redemptorist Fathers, owned the property and was building a cathedral nearby..."
Hm. "Modified beyond recognition. Well. .....that the General comes into an enormous fortune by marrying Sarah Bowdoin, so he gives the Roxbury house to his son Alexander. I wonder if I'm getting anywhere. A possibility that I had not considered in my endless manic googling was that just because the caption said 'Dearborn' didn't mean the caption was right. 'Grove Hall' was the mansion of one Thomas Kilby Jones. We award Flo a one year's subscription to Diletttante and promotion to title of Chief Research Assistant.